Working with Filled & Flooded was one of the best decisions for our wedding. The flexibility, personal treatment, and high quality product is what working with F&F will bring. Courtney is the best! 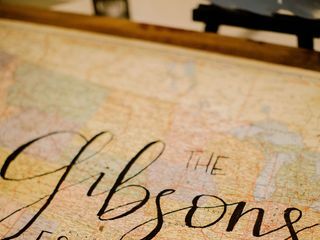 She is extremely talented, professional, and willing to work with you to design your dream custom signage for your wedding. All the acrylic, cloth, and chalkboard signs she did for our wedding were so beautiful and neat! Wonderful experience with Filled and Flooded! Courtney walked me through each step of choosing a design and had great ideas based on the few details I gave her. She was very sweet and eager to personalize the perfect piece of art! Ah thank you so much Heather!!! :)) It was so great working with you! Courtney was so great to work with! She is so responsive and is will make sure you are happy with her planned design! Her final product was perfect! Lindsay! You're so sweet! Loved being a part of your big day! Courtney was incredibly easy to work with and she brought my vision to life. 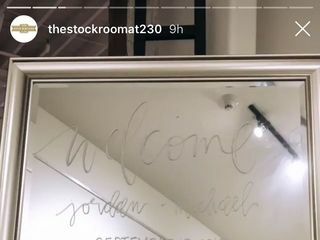 We were married at The Stockroom and that chalkboard is no joke and it looked flawless. She draws up a sample for you and makes the whole process a breeze. Her prices, flexibility, and overall attention to detail makes her the best of the best. Thank you, Courtney for being apart of our day! Stephanie! Thank you so much for your kind words!! Loved getting to be a part of your big day! Courtney was absolutely wonderful to work with! She is so sweet and very responsive. She created a chalk wall art of exactly what I was looking for to match our invitations! I highly recommend her services to all! Kelly! You're so sweet! It was so much fun to get to be a part of your wedding day! Courtney was amazing! 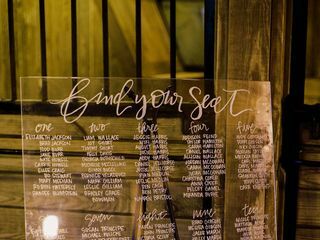 She did hand lettering and coordination for our March 2018 ceremony. She was organized, decisive, thorough, and made sure we were more than taken care of on our big day! She went above and beyond to make sure everything ran smoothly. We can't recommend her enough! We loved Courtney! She was great to work with! Courtney was wonderful! Her projector died the morning of the wedding so she freehanded our chalk wall and it looked fabulous! Courtney was amazing! I couldn't be happier with the way our mirrors and our chaulkboard turned out. We have been getting nonstop compliments about the chaulkboard. It turned out way prettier then I imagined ?? Our guests really enjoyed the chalk drawing. It looks beautiful! The price was decent considering the amount of time and effort went into it! We appreciate it! Courtney did an amazing job on our invitations....so muc so that many guests were framing their envelopes! We asked her to do a banner with a scripture verse...she had never done one but she researched it and it came out even more beautiful than we had envisioned! Just a beautiful spirit to work with and we feel blessed to have met her! I had booked another vendor for my signage for my wedding who cancelled on me the week before my wedding. 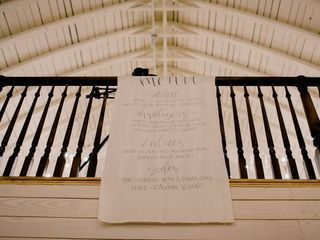 He recommended Filled & Flooded and I am so glad he did - Courtney not only got back to me IMMEDIATELY, but she was able to complete all of my wedding signage beautifully and in an extremely timely manner. I couldn't be happier with her service and would highly recommend her to anyone looking for this service. Very easy and fun to work with! Not only did I gain excellent work, but I also gained an great friend. 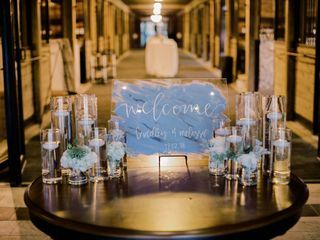 You won't regret using Filled and Flooded for your next event or home decor! 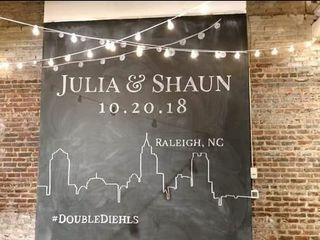 Courtney provided my husband and I will an astounding chalkboard mural with the Raleigh Skyline and our wedding monogram. Mind you, she did this on a latter for us at 7 months pregnant. She listened to every detail I wanted, and hit the nail on the head. She is one of the nicest people you will ever meet, and super talented. She already created a signature drink mirror sign for us, and a chalkboard easel sign for our rehearsal dinner. She worked crazy hours, and even met me the next morning to change something when I changed my mind. I would highly recommend all of her services for any occasion!!!!! Taylor! It was so much fun working with you. Loved getting to meet you and seeing pictures from your gorgeous wedding! My experience with Filled and Flooded was an all around wonderful one. I needed a chalkboard wall done for my wedding as well as a smaller easel but the venue had difficult time frames to work with. Courtney was very flexible and worked with me the entire way through the design process. The end result was even better than I could have imagined. Thank you for the beautiful work! Thanks so much for your kind words, Jessica! Loved getting to help you with your beautiful day! If I could give Filled & Flooded more than 5 stars I would. She went above and beyond to accommodate our schedule. The artwork was AMAZING. My guests could not believe it was hand drawn in chalk. Beautiful, quality, professional work! HIGHLY recommend! Filled and Flooded is definitely an up and coming chalkboard artist in the Raleigh area. I am so happy I randomly found her website! She did the chalkboard wall at The Stockroom at 230 for my wedding. She was dedicated to making sure her finished product was exactly what I was looking for, it being one of her first projects at The Stockroom she even reached out to the chalkboard/hand-lettering community to make sure she was going to produce her best work! The chalkboard turned out absolutely fabulous and we were extremely satisfied! She also has a great price for her work and responds day of to any email communication! 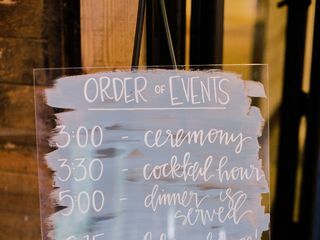 I highly recommend Filled and Flooded for wedding signage and chalkboard art, you will not be disappointed booking with her! Courtney was wonderful! I am so glad that Amanda and Holly gave us the recommendation. A picture is worth a thousand words!! She's awesome and her work matches! !